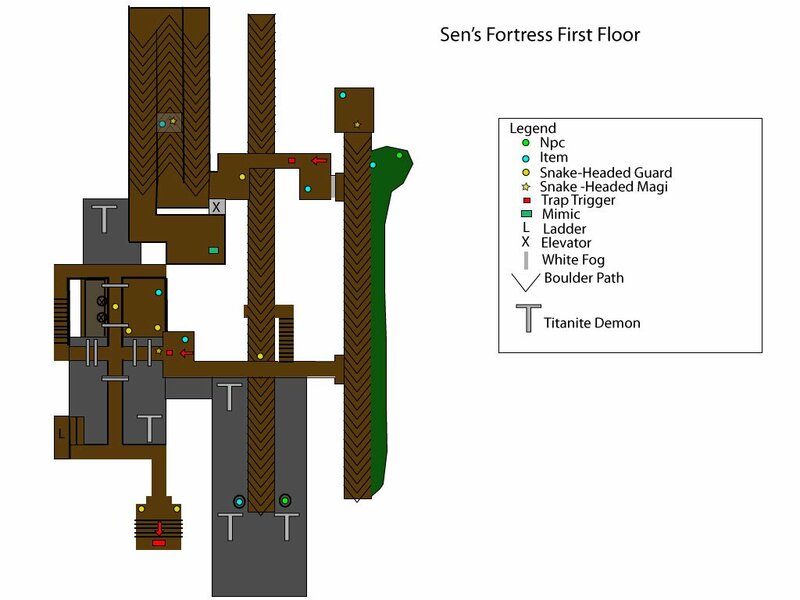 Sen's Fortress is an area in Dark Souls and Dark Souls Remastered. This dark castle is guarded by monstrous reptilian guards, boulder-throwing giants and numerous traps such as massive swinging axes, boulders and pitfalls. 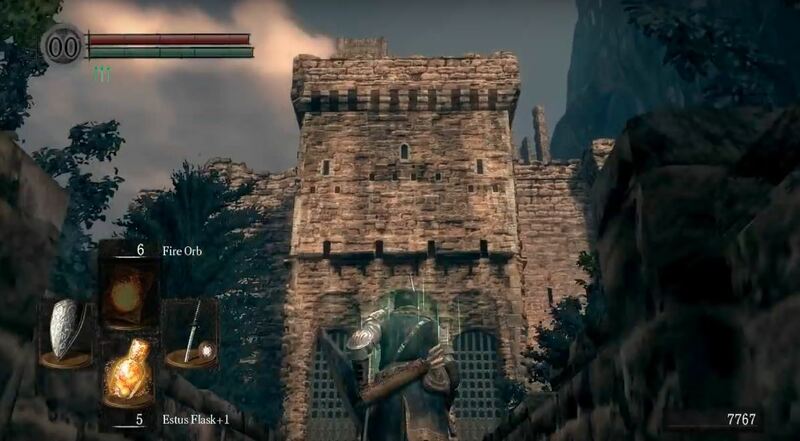 It serves as the gateway to Anor Londo. The Fortress - Through the door at bonfire above Blacksmith Andre in the Undead Parish, you will find the gates to Sen's Fortress. Though initially locked upon your first encounter, Siegmeyer of Catarina waits on the steps of the gates, in hope to enter the fortress as well. Both, the Upper and Lower Bells of Awakening, must be rung to prompt the Giant to unlock them; so you should probably get ringing before you head this way - click on respective bells to find out how to ring them. The Gates - The first room contains a new enemy, or two, Serpent Soldiers; they are as easily lured as most enemies you encounter in this game. 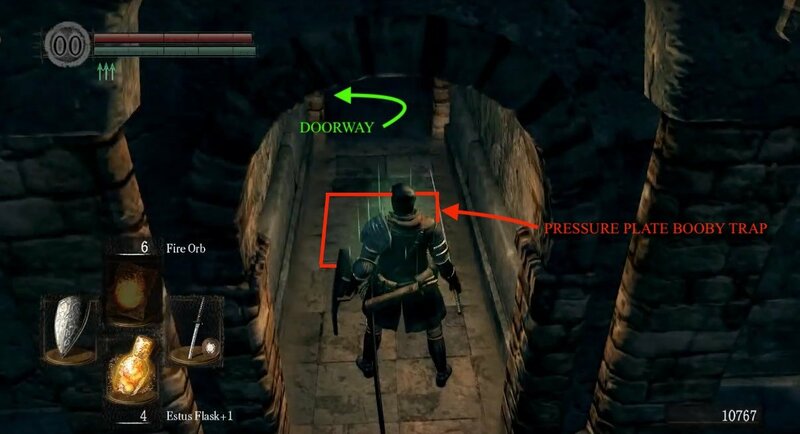 Beware of the arrow trap triggered by a pressure plate on the floor - it will fire three arrows out of a slit in the middle of the central staircase. When life gives you lemons, you can lure one of the Serpent Soliders out to the middle and trigger the plate at the right time to kill them. Before continuing up the stairway, break the pots adjacent to the doorway to find a Soul of a Brave Warrior. NOTE: You can go down into the pit here to kill some strong enemies, get souls and some items if you wish, but it can be difficult. If you want to skip this for now and come back here later, then skip to Traversing the Fortress and its Traps - otherwise, read on. 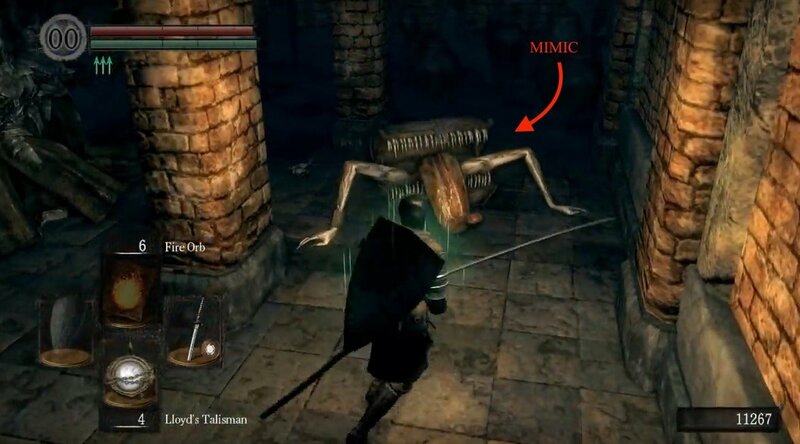 Face Your Titanite Demons - Look down and you'll see a Titanite Demon directly below you on the right side of pit - luckily you can also target him from up on the ledge. Once targeted, you should be able to easily take him out with ranged attacks if you stand close to the edge. Once the first demon is defeated, be sure your you have a full health bar as this next step requires you to drop down - which in case you haven't guessed will include some major fall damage. Once at the bottom, you'll find the ground covered in a tar-like goop that limits movement - equip the Rusted Iron Ring for easier navigation in this pit. Down here you'll find another three Titanite Demons - four if you haven't killed the one we advised you to - that do not respawn. Head forward toward the row of three pillars but beware of the three Serpent Mages up on the ledge at the end - you should be able to take them out with arrows while remaining out of reach of their spells. 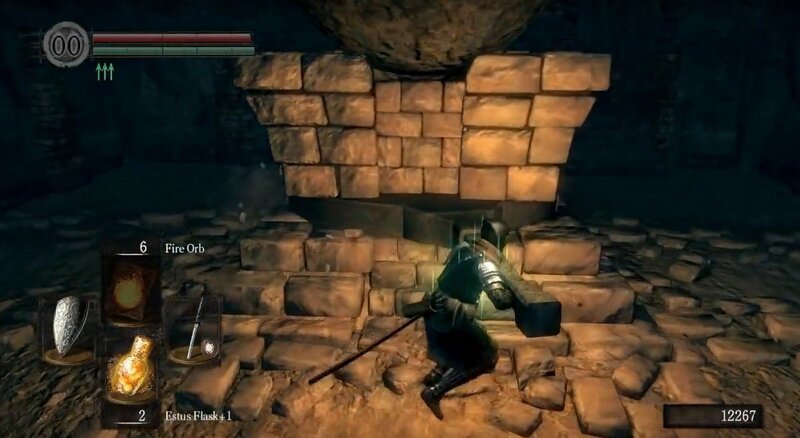 Continue forward toward the pillars and you'll see another Titanite Demon in the tunnel behind them - with the pillars in the way, this guy should prove to be an easy kill using ranged attacks - in his tunnel you'll find a Large Soul of a Brave Warrior and the Scythe. 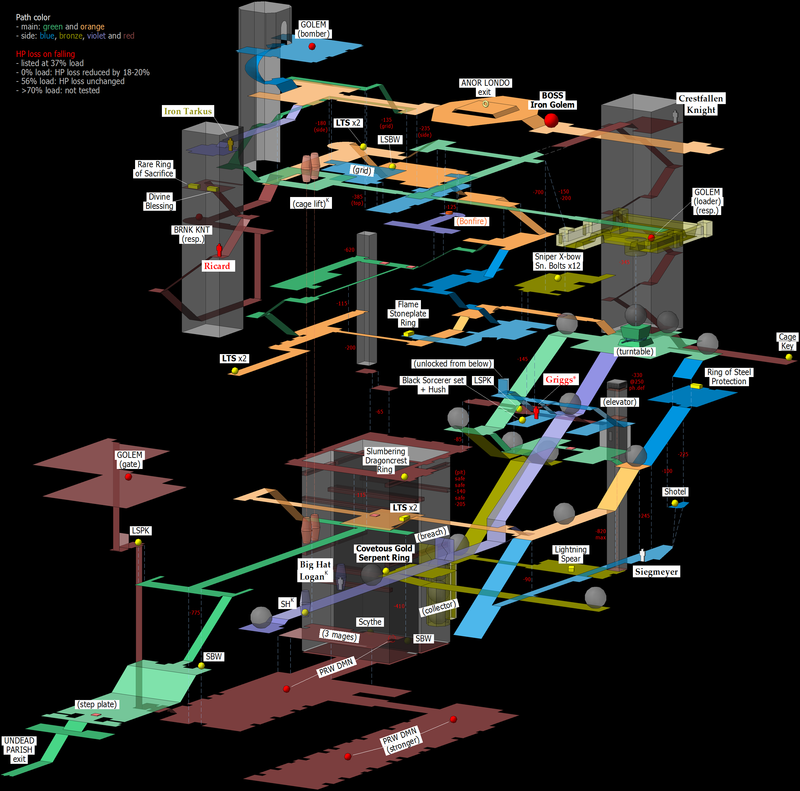 There's a passage on the right side, near the pillars, that leads to a long, wide corridor with two more Titanite Demons - there's nothing else down there though. These two demons can also be easily taken out with ranged attacks from within cages in the same room as Big Hat Logan, who you can choose to encounter later. To leave the the pit, head for the room in the corner next to where you initially dropped down, with a ladder that brings you up to the out-of-reach item from earlier, and by hitting the blocked-up archway up here you'll reveal a secret ladder to the top of the fortress where you can kill the Giant that opened the gate. Now head back down to the ledge where you arrived at this room, first. Passing the first two blades is this easiest bit, passing the third and fourth, you will be targeted with lightning spells by the Serpent Mage from the walkway above. There will also be a Serpent Solider on your walkway, at the underpass of the walkway above (Tip: You can engage the Soldier with an arrow and get him to make his way towards you - through the blades. A few well placed arrows, aimed at the mage may also knock him from his perch and cause his fall to death). More Guillotines - No bow or arrows? Then pass through the swinging guillotines as quick as you can and fight the Serpent Solider under the walkway holding the Serpent Mage; this blocks the mage's attacks from reaching you. Proceed quickly to the end of the walkway, through the door, passing another blade. Head left and up the stairs to arrive at the walkway above to find a set of 4 more swinging blades, between yourself and the mage throwing lightning your way, earlier. 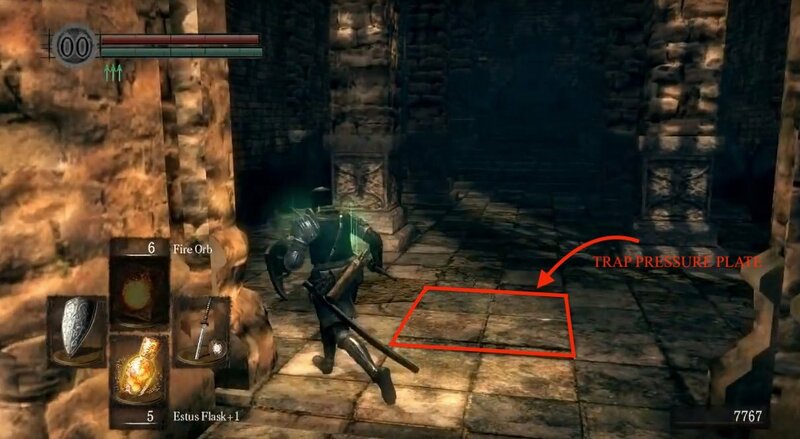 Another Trap - There is another pressure plate arrow trap before the chest holding 2 Large Titanite Shards, you see in front of you; trigger it to active the three arrows from the dispenser in the wall straight ahead, but keep your shield up (or roll to the side) and you should be fine. Continue left through the door, onwards and you'll see a sleeping Serpent Soldier leaning against a wall on the walkway below - if you wish to rescue Big Hat Logan, leaving this guy alone can help with doing so later. Continue forward and refrain from rushing out the doorway; large boulders are roll down from the left past your doorway, in intervals. The Serpent Soldier right outside will prove to be an example of what happens if you don't watch out for the boulders. As soon as a boulder passes, take a left up the ramp and sprint to the door on the left with the fog gate, but don't go through yet. You can head up further to find a Serpent Mage at the top of the ramp. A bow and arrows allow you to peek out of the first door before you attempt the sprint up the Boulder ramp. You can see the Serpent Mage in the doorway, just under and out of harms way of the boulders. Whilst exercising caution, a cheeky arrow to the mage will aggro him into coming after you, and subsequently, get flattened. We Meet Again - In the building behind him you'll find a chest holding the Ring of Steel Protection. After looting the chest, head out the door which you came from and drop to the left of the ramp to find a weapon - the Shotel. Hop down a platform further to find two Serpent Soldiers and Siegmeyer of Catarina again; if you want to avoid a tough fight and continue his quest-line, ensure you don't strike him. Follow the wall of the ramp until you can head back up and enter the fog gate; remember to time your run with the falling boulders. 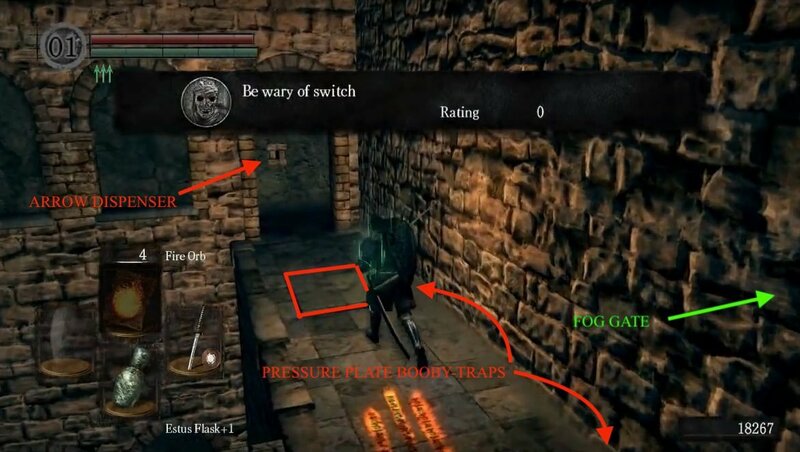 Another Trap - Past the fog, you will find an empty room, with a booby-trapped corridor on the right - a pressure plate that shoots three arrows from the dispenser behind you. There is a Serpent Soldier on the left in the next room. On the left of the room, is a doorway with rolling boulders on the outside. Beware The Boulders - Let a boulder pass by and then chase it down the winding ramp (NOTE: Any form of contact with the boulder registers as it hitting you), avoiding the spells of the Serpent Mage on the rafters above. Keep following the ramp down until you reach the hole in the floor and take the door on the left to avoid the next boulder. You can head into a secret room behind the hole, but you'll have to wait for more boulders to fall in and fill it before doing so. Once it's full, wait for another boulder to knock a hole in the wall and follow immediately after it, taking a sharp turn on the first left. You'll notice a corpse hanging on a window close-by; loot it for the Covetous Gold Serpent Ring, but be careful not to get smashed by the next boulder. There's nothing else in here, so go back the way you came in and take the door on your right. When's A Chest Not A Chest? - The noticeably askew chest on the ground in the next room is a Mimic - don't open it! This is likely the first time you'll meet one of these, so take note. They look identical to regular chests, and will either eat you whole or take off a big chunk of your health, if you treat them as if they were. Take it as a rule of thumb from this point onwards that you should always give chests a whack, or ideally a strong attack, for good measure. If it's a mimic, then this will become immediately obvious and you'll have to fight it off or run away. If you ignore them, they won't become hostile and will simply sit there waiting for you to open or attack them, but ignoring them will not allow you to get the valuable treasure they always hold - for example, if you kill this one, you'll be rewarded with a Lightning Spear. There's a lift in the corner of this room, but beware of the rather devious trap it holds. As it goes up, it'll stop for a moment at a point where you can get off - ensure you do so, as the lift will continue to elevate into the spiked ceiling (NOTE: If you need to take this lift down later, wait for it to go up into the ceiling and come back down again before you get on). From there, go up the stairs, cross the bridge then down the stairs, and finally run up the ramp to find the room with the boulder aiming mechanism. You Have The Power - You can send the boulders where you like at this point. There is a platform in the center of the room with a lever to rotate it, allowing you to aim and fire boulders through one of four openings on each side of the room (NOTE: Wherever you push the lever to, the boulder will roll down the opposite way). Turn it counter-clockwise once to fire the boulders down to where you saw the sleeping Serpent Soldier from earlier. Let a few boulders go down this way and then turn the lever counter-clockwise again - if you ignored the sleeping guard from earlier, then you'll know when to turn the lever again once you collect the souls from his death. If you don't have the Master Key, then you may as well skip to a little later - otherwise, read on. Go down the path where you were just firing boulders and you'll see that they have made a hole in the wall that you can pass through. In the resulting room, you'll see various hanging cages on either side of the walkway. Near the end, you'll see Big Hat Logan locked in a cage on the right, and you'll also find a Soul of a Hero in a cage to the left. 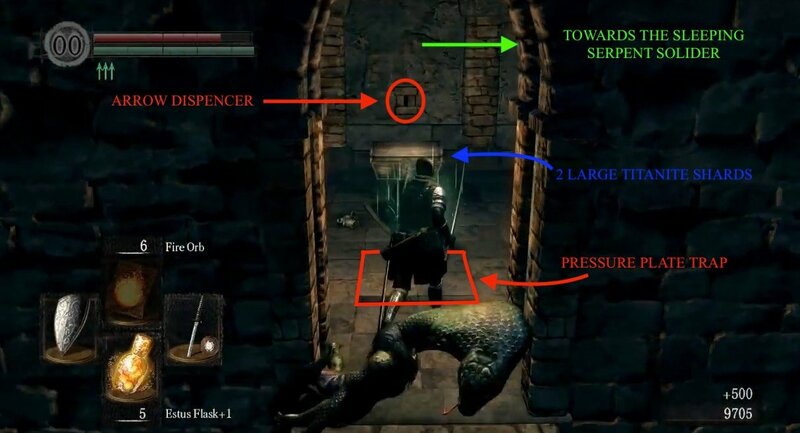 Other cages, when opened, can be used to range attack the two Titanite Demons in the tar-pit below. Talk to Logan, and then use the Master Key to free him. If you don't have this key, then neither cage will open for you right now, and you'll have to come back here later once you have obtained the Cage Key. Make your way back up to the boulder aiming room to continue. Sorcerer Set - Change the direction of the boulders to allow you to go down the path with the winding ramp that you chased a boulder down earlier. Taking this path, hop right off the side of the stairs from the highest point you can, and you should land on a ledge with the Serpent Mage who was shooting at you while you were chasing that boulder earlier. After dispatching him, collect the Large Soul of the Proud Knight and head towards the archway in the wall you just dropped from. Enter to find the Black Sorcerer Set and the Sorcery: Hush then head back to the mage's platform. Back Again - Through the hole in the wall, find a small cell with the bars on the windows pried open. Be warned; it's a long way back up, but if you go through the window here and drop down, you may have to battle a Serpent Solider to find the Slumbering Dragoncrest Ring on that floor. You can make your way down from here through a hole that has a series of ledges along the sides of it that you can drop to, and at the bottom you'll be in the tar-pit. If you didn't clear out the Titanite Demons from down here earlier on, then either get your Rusted Iron Ring out and run or prepare for a fight. Alternatively, you can drop into the starting room where you first saw the pendulum guillotines (with a bit of fall damage) on the same ledge you found the ring. Make your way back up to the boulder aiming room again. Another Trap - Back in the boulder aiming room, in addition to the four large openings you can shoot boulders through, there's also a doorway. Proceed through this passage, and look out for another booby-trapped pressure plate; this time 4 dispensers shoot 3 arrows each from the left. Doesn't matter how fast you think you are, your best bet would be to trigger the plate and retreat until the trap has finished its cycle. You'll then be greeted by another set of swinging blades along another thin walkway. For this group, sprint through them all in one go and try not to fall off (You may find that rolling through them is more effective, if you are particularly slow due to heavy armor). In the room at the other side of the walkway, there's a Serpent Soldier down a corridor on the right with a floor-less doorway, that drops down to the pit, behind him - be careful. Turn around and you'll see a staircase with a Serpent Mage at the top. Take care of the mage, but don't go up there yet - take the passage to the left of the stairs first instead to find Serpent Soldier and an item. Traps Everywhere - Go back up the stairs, to come across the final set of swinging blades on the thinnest of the walkways. Before taking them on, you should take out the Serpent Mage to the left of the walkway, with ranged attacks. To get past the blades here, take them on in pairs. Past them, you should see a fog gate to your right up some stairs, and a path to the left to the area the mage was at. Beware of the two pressure plates that trigger the arrow trap, one on either side - the arrows come from the left if you trigger either switch. Go through the fog gate and you'll find yourself on the roof of the fortress. Saving Grace - Once on the roof, you'll see the Rock Giant straight ahead of you - he's the one that's been dropping boulders into the boulder aiming room. He's harmless, but kill him with arrows if you please, just note that he respawns. Now, it is in your best interest that you turn left and continue up the stairs. Be wary, as you are about to be greeted by some huge firebombs. The Firebomb Giant on the roof will be hurling these down, every chance he gets until you get to him. After one explodes, wait for the flames to subside and then run quickly up the stairs, continuing up the second flight of stairs ahead of you. Up here you will notice a corpse on the floor holding a Large Soul of a Brave Warrior, and if you look to your right you may notice an opening in the wall - drop down here to find the only bonfire in the area. Make your way back up, following the only available path, to end up at the fog gate once again. Head right, down two flights of stairs to find two Balder Knights, and a chest with the Flame Stoneplate Ring. 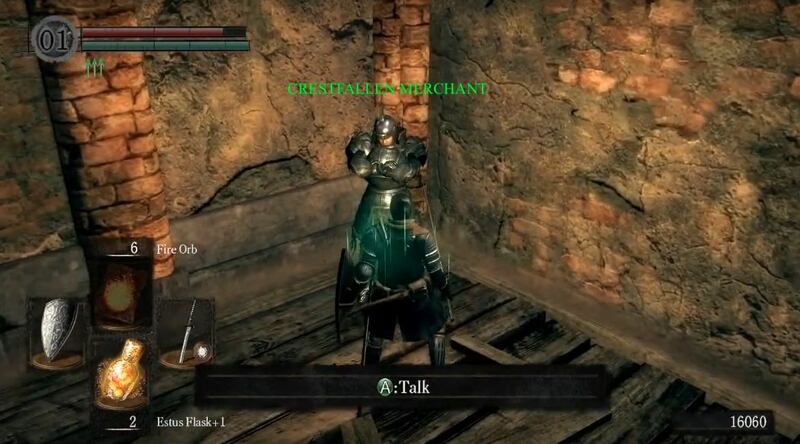 Tower Knight - Ascend the third flight of stairs where you'll see another corpse holding a Large Titanite Shard. 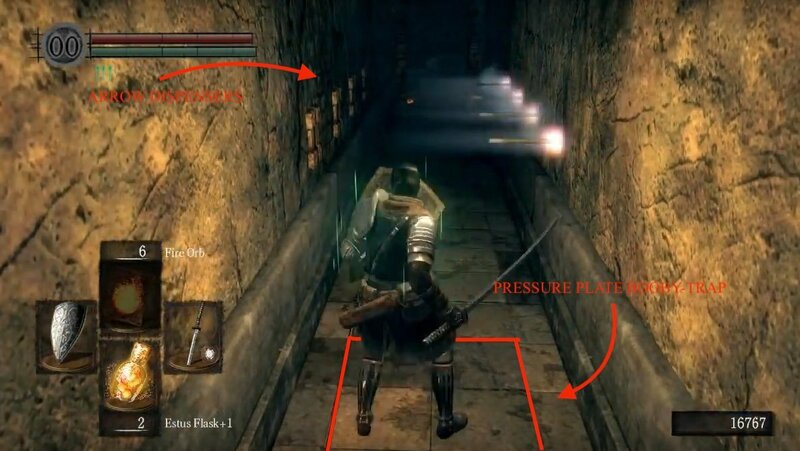 Going straight leads you to a Tower Shield Knight with a painful mace, however can be taken out using arrows without getting his attention by standing before the stairs leading down to him. Past him, to the left, descend the ladder and continue along the path toward the tower ahead where you will be attacked by Ricard the Archer as you climb the stairs - he's an easy fight and drops Ricard's Rapier. Past him you will find two chests holding a Divine Blessing and a Rare Ring of Sacrifice. 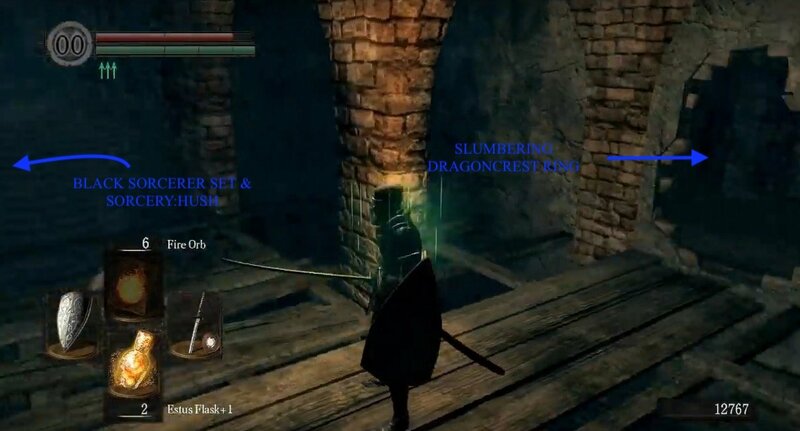 Becoming A Sniper - Head back the way you came - where you found the second corpse with the Large Titanite Shard. This time go up the stairs to the left and you'll find yourself on an elevated walkway - beware that the Firebomb Giant can still land his firebombs on you. The path splits into two here with a jumpable gap on the left side; if you take a running jump off the walkway and straight forward towards the Rock Giant you will land safely on the ledge of his rooftop. Turn around, look down and at the bottom you will see a corpse - drop down here to find a Sniper Crossbow and some Sniper Bolts. From here jump down to find the Flame Stoneplate Ring and Balder Knights we saw earlier. Finding Shortcuts - Make your way all the way back up to the walkway again, ignore the jumpable gap on the left again and take a right for now where the path forks yet again once inside the building. Left is an Undead Knight you can safely ignore, and a vagrant spawn point. Going right leads you into a room with two hanging cages in it, but without the Cage Key you won't be able to open them. Once you get the key, these can take you down to the first room with the swinging guillotines, opening up a valuable shortcut that by-passes a lot of Sen's Fortress. On the other side of the room with the cages, you'll find a door leading outside again and up to a thin walkway that turns two corners. There's an Undead Knight Archer firing at you here and the Firebomb Giant can also throw bombs in the way. You'll have to be quick about traversing the walkway, but follow it around without falling off and you'll have your melee fight with the Archer, if you didn't kill him already. Put Out The Fire - In the next room, you should see the fog gate which leads to the boss - you can look out the windows beside the gate to get a early glimpse of him if you want. A quick detour up the spiral staircase, opposite the fog gate, will allow you to deal with the pesky Firebomb Giant. To defeat him just stay close behind him, hack and slash at his legs and back away when he begins to stomp. Eventually, he'll throw a tantrum and just drop; this allows you to attack him freely. He does not re-spawn once he's killed. His death will not only reward you with 3000 souls, but with the peace of mind of your safety from fireballs for the remainder of your rooftop travels. Crestfallen Logan - Head back to the jumpable gap in the walkway. Make your way back to it and take a running jump over the gap (being under 25% equip load here will help make the jump easier), continue onwards to find the Crestfallen Merchant inside the tower. Head down the stairs to find a Serpent Mage on a bridge. Behind him you will find a corpse with the Cage Key, which will allow you to access a soul and free Big Hat Logan (if you didn't have the Master Key already) and unlock the two hanging cages for the shortcut mentioned above. The Iron Giant - With all that done, now it's time for the boss. 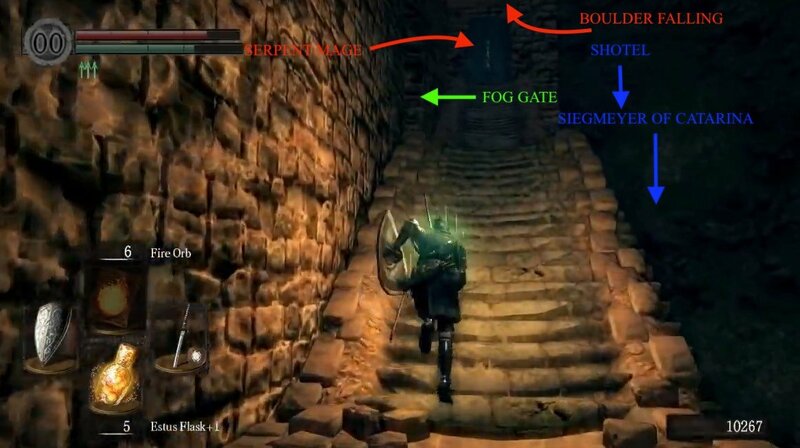 Make your way back up to the room at the top of the fortress with the fog gate; but If you're in human form, you may want to take one last detour. 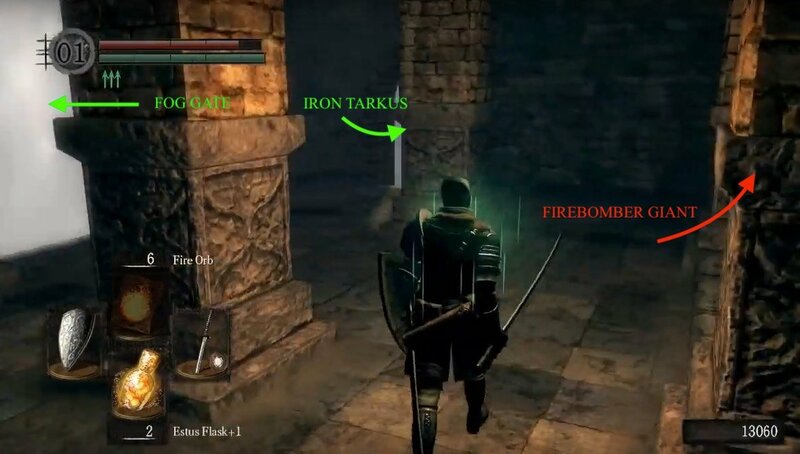 Instead go through the doorway to the bridge and run across to find a room where you can summon Iron Tarkus to help with the boss fight. When you're ready traverse fog gate. To Londo - After the boss fight, you will be rewarded with the Core of the Iron Golem and a Humanity, and will also see a glowing orange ring in the centre of the arena. Touch the ring and you'll be treated to a cut-scene where you're carried away by three Bat Wing Demons who safely deliver you to Anor Londo. Note: If you want to get back, turn around and talk to the bat wing demon perched on the wall, and you'll be taken back to the Sen's Fortress boss arena. Big Hat Logan - After breaking a hole in a wall with a boulder (note the wall can be broken by hitting it with your weapon), you'll find him in a cage that can be opened with either the Master Key or the Cage Key that you find in the area. Crestfallen Merchant - The merchant can be found across a broken bridge after reaching the rooftop. You must run and jump across to make the gap. Siegmeyer of Catarina - He can be found outside the gates before they open and once they are you can find him near the first rolling boulder section. 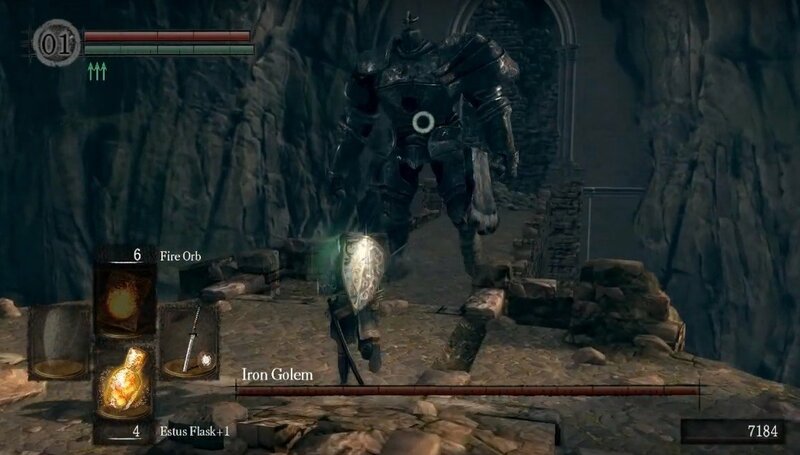 Iron Tarkus (Summonable NPC) - His summon sign is found in the tower across the bridge nearest the boss' fog gate, but only if you are in human form. He helps greatly during the boss fight. on my very first playthrough years ago i didnt even notice the bonfire there (nor the elevator!) and went all the 51234321 tries on the boss through the whole minefield. terrible memories. but since then i can do it blindfold. I must&apos;ve done Sen&apos;s like 3-4 times in different playthroughs and I always end up honest to god exhausted after it. The instakill traps, the ultra demanding timing on the rocks, the self resetting aiming device, the super tight corridors with the serpent men wailing on you nonstop with little room to fall back, nevermind the fact that you won&apos;t be able to reach the bonfire at the top unless you kill the bomb giant if you don&apos;t have prior knowledge of it. 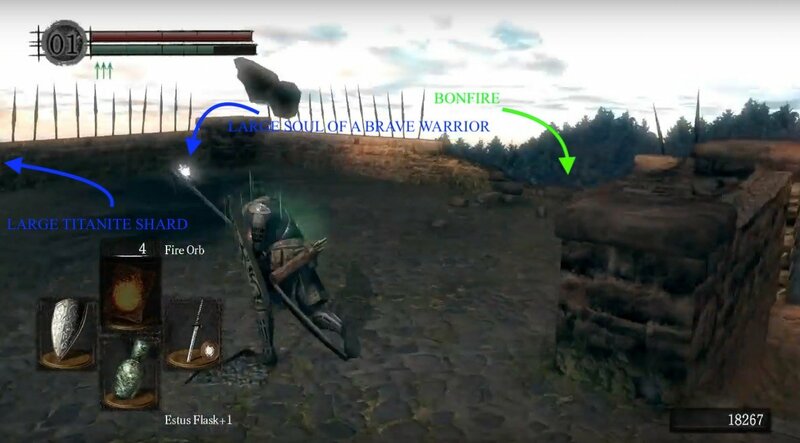 At least in Blighttown you can take it easy, bait enemies one at a time and there&apos;s a bonfire that&apos;s within reasonable reach of everything else. "...and you&apos;ll find three-four if you didn&apos;t kill the first one like we advised- titanite demons that do not respawn." Titanite demons never respawn anyway. Why does it say Very Good Carving is here? And why as an upgrade material? Takes roughly 4-5 boulders to fill the trap leading to CGS Ring. This NEEDS to be added that the boulders won&apos;t stay the way you set them. After you left for some reason the wheel reset. That&apos;s *****ing idiotic. Ok so there are a lot of idiot trolls in the comment section. It&apos;s cancer actually. Beware everyone. I ran through Sen&apos;s Fortress without getting hit. I didn&apos;t know about the gate giant until I sniped him from that dead-end outside the cage lift. I noticed he and the firebomb giant drop more souls than the stone-setting giant, by about 40%. I guess it&apos;s because they don&apos;t respawn. Does he drop anything good? Because I didn&apos;t know I could reach that balcony until warping out, doing some other nonsense somewhere else, then coming back to fight the Titanite Demons, and there was nothing up there. So I touched the ring before the iron golem dropped and didn&apos;t get his souls nor a sunlight medal for the jolly coop. Beware, i guess. So this morning I was making my way through Sen’s when at the top near the Crestfallen Merchant next to the gap you need to jump to reach the merchant, I saw a red serpent mage. He looked just like an invader, but I was hollow. I didn’t want to risk falling and losing my souls, so I ran to a safe sniping spot and pelted him with about 30 arrows, all head shots. He tanked em all. There’s no mention of an NPC invader here. Any ideas? This article says that the mimic looks indistinguishable from a chest, but there’s one tell that makes it really easy to spot the difference, no test hits required. Just look for the chain, if it’s curled backwards then it’s a regular chest, if forward then it’s a mimic. The way I remember which direction is which is that the chain is always pointing towards the treasure; if it’s pointing towards you then you’re the treasure. Anyone else notice that the page has the mimic drop wrong? It links to the lightning spear (the miracle which you only get from joining the Warrior of Sunlight covenant), but the mimic actually drops a lightning spear (a spear upgraded with lightning damage). Does big hat logan move after you find him? Anyone know what the Tower Knight drops? There doesn&apos;t seem to be a page for it. It&apos;s possible to kill the fire ball giant with a bow by standing halfways up the last stairs to the walkway with the gap in it. Back up just enough to be able to shoot arrows at it. It takes around 50 arrows with a longbow +5.